The Valley of Fire State Park is Nevada's oldest park, and is so named because of its red sandstone formations which look like they're on fire when the sun reflects off them. The rocks were shaped over 150-milllion years ago, when dinosaurs roamed the area. Apart from the rugged beauty of the surrounding Mojave Desert, the main attractions in the park are the well preserved petroglyphs that adorn many of the red sandstone structures, left there by the ancient Pueblo people, also known as the Anasazi. 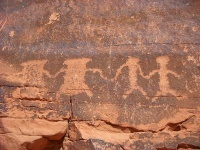 This rock art dates variously from 300 BC to 1150 AD. Visitors should head to Atlatl Rock for some of the finest examples of ancient Indian rock art or petroglyphs, including a depiction of the atlatl, which was a notched stick used to propel spears, a predecessor to the bow and arrow. Other activities here include hiking, camping, and picnicking.